Science has been a part of the Muslim world. From everyday lives to the invention of sophisticated natural law, Muslim scientists share their contribution to the world. While religious education commonly understood as mere teaching of religious subject, Islamic education does not separate science to the broader education context. Therefore, science education has been and will continue to be an important aspect of Islamic education. Science teaching in Muslim schools has been developed to meet the expectation on how young Muslim generation can learn and practice science within the context of Islamic teaching. While scientists, such as Hoodbhoy (1991) argues that there is no such things as Islamic science as well as science of other religions, integrating science into the whole context school curriculum is very important. In that case, educators in the Muslims worlds offer various perspectives on how science is bet integrated into the curricula of Muslim schools. The 4th International Conference on Education in Muslim Society (ICEMS) 2018 is designed not only to share the research but also offer recommendations for the governments, educational intitutions, and other stake holders to improve the quality of STEM education. It is conducted by the Faculty of Teaching Sciences of Syarif Hidayatullah Islamic State University (UIN) Jakarta. The committee invites scholars, researchers, policy makers, teachers, and students from various countries to participate and work together to improve the quality of STEM education in Muslim community. 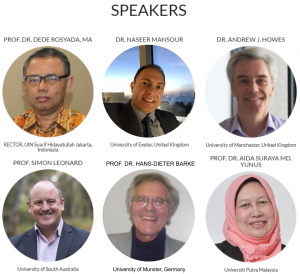 Hosted by UIN Jakarta, the 4th ICEMS 2018 is intended to provide an opportunity for various stakeholders of STEM education especially in Muslim Society around the world to share their works, opinions and experiences in an open academic forum. The theme of this year conference is “New Perspective on STEM Education in Muslim Society: Current Issues from different lenses”. The theme attempts to reflect various aspects of both thoughts and research findings related to STEM education in Muslim countries, ranging from curriculum, research and development, new pedagogy and andragogy, new technology in stem education and so on. In addition to disseminating thoughts and research findings, this conference is also expected to provide an invaluable opportunity for networking among international participants both individually and institutionally. Providing an international scientific forum for researchers, scholars, practitioners, and students to exchange ideas, point of views, critical review, and to communicate and discuss those issues in the field of STEM Education. Discussing and generating approriate paradigm for getting a better education to form new academia. Providing beneficial and valuable contribution for the development of STEM education. The theme of the 4th International Conference Education on Muslim Society (ICEMS) 2018 is “New Perspective on STEM Education in Muslim Society: Current Issues from different lenses”. *additional IDR 750.000/paper, if paper selected to be published in EDUSAINS & TARBIYA (National Accredited Journals), and additional IDR 1.500.000/Paper, if paper selected to be published in IEEE and Scitepress (will be submitted to SCOPUS) . Syarif Hidayatullah State Islamic University Jakarta, Harun Nasution Auditorium Room.